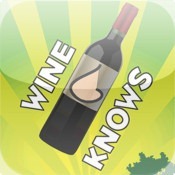 Wine Knows Trivia iPhone App Giveaway! With the buzz happening around the Weekly Wine Quiz, I’ve got wine trivia on the (vino-soaked) brain lately. So it seemed serendipitous that I was contacted by the folks at Trivia Knows to try out their new cross-platform mobile wine trivia game, Wine Knows Trivia. They invited me to take a sample test rive of the game on the iPhone, and I can say that I am fairly impressed – the interface is slick, there’s a bit of game-addiction action as you rack up bottles that measure your winnings/progress (which you can then share via twitter, Google+ and Facebook for bragging rights among your social circle as to who has the most wine smarties). And we all know that wine knowledge makes you appear sexier to your potential amorous pursuits (just sayin’). 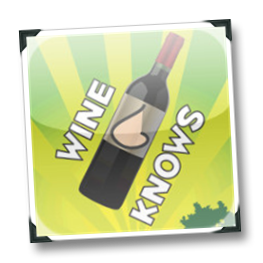 And now YOU have a chance to win a copy of Wine Knows Trivia for iPhone/iPad/iPod Touch, because we’re giving away a redemption code for the app to THREE lucky commenters this week! Here’s the deal: you comment on this post, and at 9PM ET on Friday, January 27th I will randomly select three winners from the comments who will receive a redemption code via e-mail (if you win, you need to act fast – after February 3rd, the codes evaporate into the ether, never to be seen again!). Comment discussion topic coming after the jump. 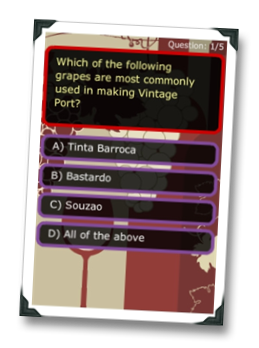 For example, do you know the most commonly-used grapes (of the 14-some-odd varieties allowed) in the making of vintage port? Probably not off the top of your noggin’. It’s not all a bottle of rose, of course – questions that you answer incorrectly tend to repeat themselves until you get them right, which you may find annoying. And as far as I’m able to discern, the app totally ignores the mute button on the iPhone, and there’s not setting to turn off the sound effects and music, forcing you to manually reduce the volume if you want to play while you’re supposed to be paying attention in a meeting. And finally, some questions use the term “varietal” as a noun (totally unforgiveable!). Anyway, as a wine geek you can do a lot worse than while away your time learning some interesting tidbits about your favorite beverage by challenging yourself with all the great questions that Wine Knows Trivia poses for the bargain price of $0.99. What’s the most difficult wine quiz/test/question you’ve ever faced? For me, it would have to be the section on the WSET Advanced written exam that dealt with Spanish brandies – I was totally unprepared for the inclusion of that (shame on me!). But then, the exam seemed to include a good proportion of questions pertaining to the Pacific Northwest of the U.S., and if had been a Londoner studying for the exam I probably would have sh*t myself on those questions! In a wine exam a few years ago I had to list the village of some less than famous Premier Cru vineyards. That was a doozy! 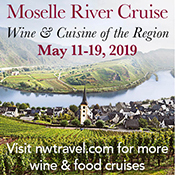 Eric – yeah, the questions that effectively amount to geography were always tough for me; not just in wine, I mean, though wine is an AMAZING way to up your geography IQ. Cheers! Thanks, Jon – interesting, will have to give sporcle a look-see. Cheers! I would have to say my first blind tasting with several winemakers from the area, I was sweating bullets; I later learned that "wrong" impressions often are more helpful of a learning tool than "correct" impressions. Thanks, Joel – great point! I have never been that afraid to blurt out what I get out of a wine or which I prefer, despie some strange looks as a result (but then maybe I am just rude? :). Cheers! Worst for me was a Diploma essay on the wine business. You have very wealthy friend that wants to plant a vineyard and start a winery. Advise him on waht needs to be done or some such question. Figured peice of cake for me. Got a D on the paper. Another one, where we were only studying half of the still wines of the world in the 1st year, in a blind tasting identifeid the wine as NZ SB of course it was from South Africa. New Zealand was not to be studied until year 2. Mark, do you ever do any work? Definitely had to be a WSET question… It was on pot still construction. Nikki – yeah, those were… not easy! :) Cheers! Finished the wine origins test and found it very hard to switch gears from Champagne to Port, but the hardest is the German/Austrian wine scheme, they switch levels between countries and one area in Austria, has its own separate classification system. Thanks, Will – yeah moving between mindsets on that stuff can be tricky (especially since hardly any country does it quite the same way :). Cheers! New to 1winedude. Checking out some of your recommendations. 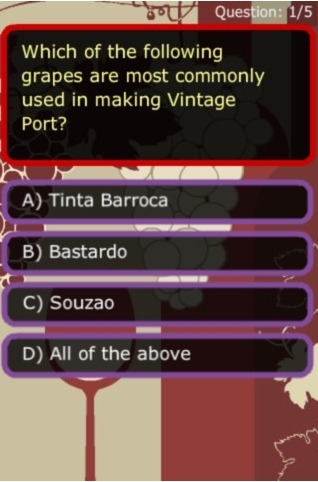 Always up for a trivia game and wine is my new obsession. I want an app or guide that can help me pronounce some of these eastern European and Greek wines. WTH! I feel like I'm back in high school science class. Gay – HA! Agree that a wine pronunciation app would be AWESOME. You should launch and sell it – I know MANY people who would buy that (myself included :). Greg – HA! Ok, will be bookmarking that one. Shame on me, because I've been reading WLP on an off for YEARS and never really noticed that resource! Dennis – toughest one of all! We have our winners! Thanks for the great comments, everyone!